The theme of the life on the Earth birth and development has always been the topic interest of mankind. NetEnt also decided offering its own theory and suggested gamblers their bight Evolution slot. Follow the development of life, starting from the simplest organisms and plunge into the bottomless ocean. Stay surprised at the sight of the simplest organisms (card symbols), unusual creatures such as Basilisks, Dragon-mice and Squirrels that can fly. Explore the sea depths, where life originated and climb to the land in special bonus level. This NetEnt gaming machine has a huge quantity of unusual prizes. Use Scatter and Wild benefits. Start an amazing journey for hundreds of billions of years, following all the stages of evolution and win valuable prizes — gamble at 5 reels and 25 paylines! 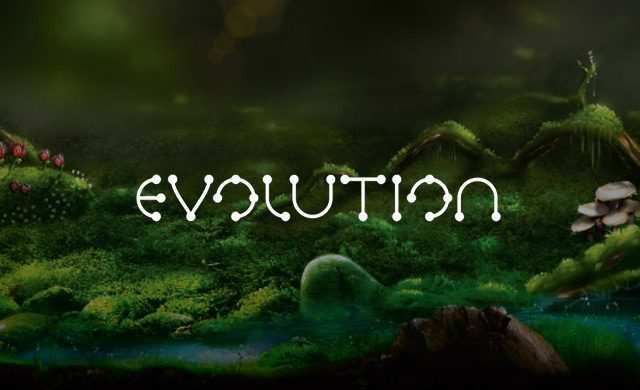 Stylistics of Evolution slots, their music design and interface hide the riddles of evolution emphasizing the game theme. All the characters in the main game move up, not down, as in most machines for gambling. Colorful background, the design of symbols and keys helps recreating the necessary atmosphere. The main symbols are awarded according to the “stages of evolution”, so you can watch how the simplest creatures turn into mysterious sea creatures and even into bizarre squirrels that fly like birds. The built-in Evolution Feature “transforms” symbols into more valuable ones, bringing even more credits to the player. This feature becomes available in the bonus round, and it finishes with the bonus game end. All character transformations are colorfully drawn and animated. The minimal bet here is 25, and the maximum that you might win is 500 Euro. Although Evolution slots do not have any jackpot, they give prizes extremely often. The classic control panel is quite easy to learn. It has fixed lines, so the player can only operate with different bets. You can set the denomination of coins through Coin Value, and set the bet with Bet Level. For those wishing to risk, there is a Max Bet button. The auto play mode is started using AutoPlay. PayTable informs players about the main combinations cost. All the additional data and settings are hidden in the lower left part of the screen. The key to the additional level and prizes are 3 or more Scatters. The player will be “transferred” to the land, where he’ll receive 10 – 20 free spins and the Evolution Feature. With this option, cool combination that might bring winnings in the bonus round will change all winning symbols, significantly increasing the payout. An incredibly generous game, the bonus one, is the main slot highlight: all winning combinations per a spin are paid. Before risking gambling with real money, play free Evolution casino slot machine and take pleasure of its excellent graphics, unique style and pleasant gameplay. Go to the distant past, follow all the stages of evolution, and be ready getting generous prizes! 0 responses to "Evolution Slot"